It’s been a while since we’ve had such a perfect episode of Black-ish, but “Being Bow-racial” was worth the wait. Junior’s white girlfriend sends Bow on the sort of identity crisis she hasn’t had since college. She narrates, giving us a much-needed break from Dre’s sensitive ego. Johan even returns, with a growing attraction to Ruby. Yes, that’s right. It’s an incredible episode. Bow meets Junior’s white girlfriend, Megan, who had saved him from a bunch of bullies, and Bow instantly hates her. Dre figures out Bow dislikes Megan because she’s white and it fills him with glee. Their mistrust of white people is something they can use to bond as they grow old together. He’s surprised because Bow claims not to see color, and she reminds him that’s not who she is. Johan thinks they should overlook all the race stuff and celebrate the fact that Junior has a girlfriend. After all, Junior is a tough sell. He wears a cape. Although Dre is enjoying Bow’s anti-Megan feelings, Ruby is confused by them. Ruby knows it’s natural to hate the women your son brings home to date, but Bow has a white father. She tells Bow that she’s white, which Bow denies. Ruby tells her a black woman would be able to tell if someone was sneaking in in the middle of the night to cut off inches of her hair. Not that Ruby has been doing that to Bow. Of course not. Ruby tells Bow that if she knew who she was, she wouldn’t have any issues with Junior bringing home a white girl. Meanwhile, Bow talks to Johan about their shared experiences growing up as children of an interracial marriage. He suggests she needs to do a personal inventory and figure out how she wants to identify. He considers himself to be mixed. When Bow brings up Ruby’s comments, we learn that Ruby has been sneaking up behind Johan while he’s bent over in the refrigerator. Ruby reminds him that they’re not related by blood. She goes so far as to throw a book on the floor, as if she’s dropped it, so he can bend over and pick it up, shirtless. 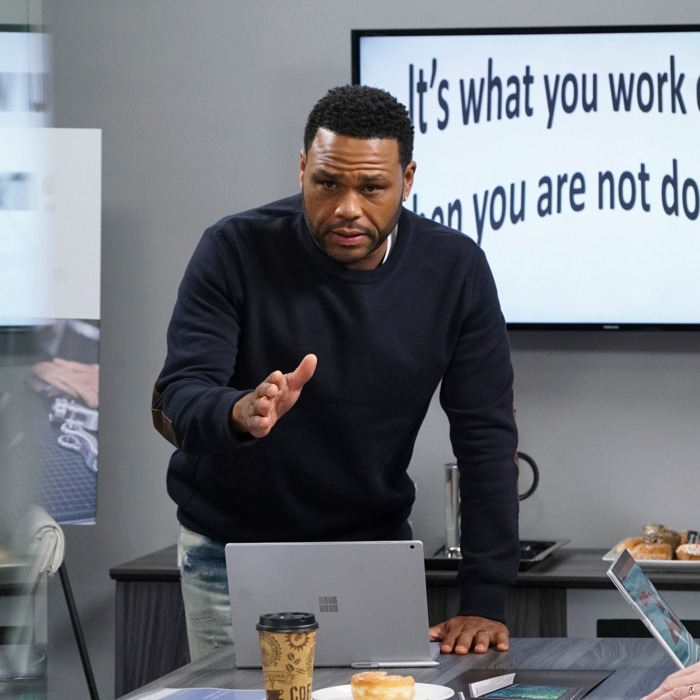 Johan is helpless to resist Ruby and thinks it’s only a matter of time before he gives in, and it’s all one of the funniest side stories Black-ish has given us in weeks. I can’t wait to see if this develops further because Ruby is fantastic when she’s working her womanly wiles. Bow eventually talks to her father; he sees her as a black woman, which surprises her. He tells her the world made the choice about her identity long before she could for herself. He helps her get to the root of her anger: She thinks Junior’s choice of a white girlfriend is a rejection of her and of their big, beautiful black family. Junior’s attraction to Megan doesn’t have anything to do with that, though. The show didn’t address it directly, but Megan had a kind heart and saved him from bullies. That’s definitely a Bow move, and Junior falling for Megan reflects the impact Bow has had on his life. Bow didn’t see it that way, and it brought up her childhood identity crises, like when her white girlfriends from high school had her play a flying monkey in their production of The Wizard of Oz, or in college, when she approached a table of black women dancing and rapping like a living caricature of hip-hop. Bow leaned in to stereotypes because she was looking for a home, a way of figuring who she was. While talking to her father, Bow realizes she had to go back into her past to embrace her children’s future. There’s so much to love about how Black-ish addresses this issue of identity, but the best thing is that Bow goes to people like her father and brother, who have better life experiences within interracial and biracial communities. It would have been a mistake to lean on Dre, who is completely out of his league here. At work, Dre tells the gang about Junior’s love life and Josh asks for dating tips. Dre admits he’s no good when it comes to picking up white women. He grew up in the ’hood and went to an HBCU, so there was no way to master the art of dating outside his race. (Also, white women like Mr. Stevens’s wife are scared of him.) Charlie, on the other hand, is the Bunny Magnet, Lord Snow, the White Walker, Anglo Saxon Jackson, and Snow J. Pimpson. He’s got major white-girl game. He keeps a pair of John Mayer tickets on him at all times, even when Mayer isn’t touring. He could’ve had Dave Matthews tickets, but he’s not interested in women who are that white. As the men try to figure out the best way to approach white women, Daphne (whose name I had to look up because it’s been so long since we’ve seen Wanda Sykes on the show) pops in to scold them for not working on an important Microsoft presentation. When she leaves, Charlie confides in the men, “And that’s why I keep me some snow.” Ah, that old joke about how black women are mean and angry so dating a white woman is better. Insert eye roll here. Maybe this joke would’ve been less sour if there had been some counter opinion. The men go on to look up tips for talking to women of color — like black, Korean, and Mexican women — but there’s real discussion of why they’re interested. Charlie’s snow comment after Daphne’s reprimands makes it seem like there’s a benefit to dating a white woman, so what’s the benefit of dating women of color? No one says and it implies creepy, sexual stereotypes that probably should’ve been addressed. That being said, Deon Cole’s Charlie really shines during the work scenes. When Josh and Mr. Stevens want to know the “safest” way to approach black women (Mr. Stevens pays special attention here), Charlie advises that you always address women of color by their color: “Hey, green eyes! Hey, purple jeans! I see you, white French tips.” It was such a real moment for me that I had flashbacks to all the times men have tried to get my attention by calling out what I was wearing. Remembering now, I can laugh, but in the moment, it’s annoying, as Daphne demonstrates when Josh calls out her bloodshot red eyes. She blesses him with a double-barreled middle finger salute. Television shows with biracial actors rarely let those actors play characters with similar backgrounds. They usually play characters with their most visible identity, like how Lisa Bonet’s Denise Huxtable had two black parents. In Bow’s historical moment, she mentioned that the 1990s showed a 500 percent increase in people identifying as biracial, and we saw that effect as television finally allowed actors, usually women, to play characters who reflected their racial backgrounds: Freddie Brooks (Cree Summer) on A Different World; Lynn Searcy (Persia White) on Girlfriends; Rachel Zane (Meghan Markle) on Suits. Even Tracee Ellis Ross’s own career is telling: How many times has she played an explicitly mixed-race character before Black-ish? Despite some progress, it’s still rare for a show to address the confusion that many mixed-race people feel. If Bow identifies as a black woman, is she rejecting her father and his heritage? It’s why someone like Johan prefers being called mixed or why Tiger Woods refers to himself as “Cablinasian.” It’s a way of honoring all parts of their racial identity, even if the world tries to force them into one choice. It’s a delight to see Black-ish do a characteristically stand-up job of addressing a complicated matter with humor — and in such a way that will prompt real-life discussions in its audiences’ households. “Being Bow-racial” is a return to the work that solidifies Black-ish’s place in television history.